A kid pushed my nephew down on the playground yesterday. He took it like a little man. Turning on his heel this a.m. to head back out in the dangerous, murky underworld known as kindergarten. What this little bully strike again? Push him down into the sandbox? This lesson is called “how to be resilient” and it’s one that you can take to heart – whether you’re just learning to socialize or you’re all grown up. If we can take anything from my nephew it’s that when life makes a sucker out of you, you get back up again … with one hand over your face and the other one swingin’. This applies in the kitchen, too. I’ve made pulled pork a hundred times now and I’ll just go ahead and admit it’s never been my strong suit. Slow cooked, braised, grilled, direct heat, indirect heat. But the other day I smoked it and I do mean smoked it. The thing was delicious. Crispy on the outside – inside soft and bangin’ with flavor. First smothered in spices: paprika, chile powder, ancho chile powder, garlic powder, onion powder, dry mustard. Then cooked over a bunch of hickory chunks and a load of charcoal. 1 drip pan filled with water, 4 hours, 2 beer and 3 chapters of Tina Fey’s BossyPants. Out on the porch. 2 pups playin’ tug of war with a rope. Feelin’ fine. When dinnertime rolled around, we had a time of it. Pulled the pork apart and drizzled it in a reduction of ketchup, molasses, brown sugar, and plenty of Sriracha*. Got a huge kick out of how happy it made my husband – poor guy doesn’t get a lot of home cooked meals since the cookbook* has taken over. Made me remember how much I just love to cook real food. And as for that mean little dude… that schoolyard bully …. I’m watchin’ you, guy. But I suppose you’re just out there swingin’ too, hoping to find some sense … and maybe trying to bounce back from some other great and important obstacle. *You can never have enough of this miraculous condiment, so adjust this recipe to taste. * Todd Kelly’s Orchids at Palm Court cookbook will be on shelves before Thanksgiving. A year-long chapter that I am excited to close and ready to share. For the sauce: Combine the vinegar, ketchup, molasses, brown sugar, salt, red pepper flakes, black pepper, and white pepper with 1 1/3 cups of water in a nonreactive medium-size bowl and whisk until the sugar and salt dissolve. Taste for seasoning, adding more brown sugar and/or salt as necessary; the sauce should be piquant but not quite sour. For the pork: If using the rub, combine the mild paprika, brown sugar, ancho, celery salt, garlic salt, dry mustard, pepper, onion powder, and salt in a bowl and toss with your fingers to mix. Wearing rubber or plastic gloves if desired, rub the spice mixture onto the pork shoulder on all sides, then cover it with plastic wrap and refrigerate it for at least 3 hours, preferably 8. Set up the grill for indirect grilling and place a drip pan in the center. When ready to cook, if using charcoal, toss 1 cup of the wood chips on the coals. Place the pork shoulder, fat side up, on the hot grate over the drip pan. 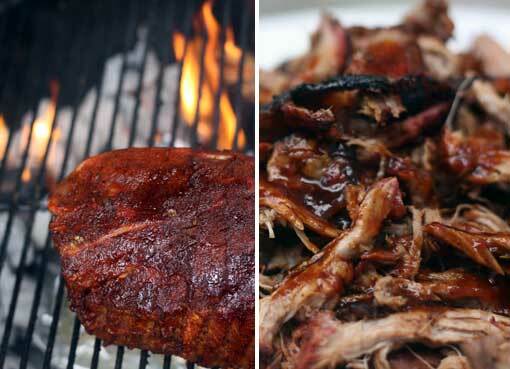 Cover the grill and smoke cook the pork shoulder until fall-off-the-bone tender and the internal temperature on an instant-read meat thermometer reaches 195°F, 4 to 6 hours (the cooking time will depend on the size of the pork roast and the heat of the grill). If using charcoal, you’ll need to add 10 to 12 fresh coals to each side every hour and toss more wood chips on the fresh coals; add about 1/2 cup per side every time you replenish the coals. With gas, all you need to do is be sure that you start with a full tank of gas. 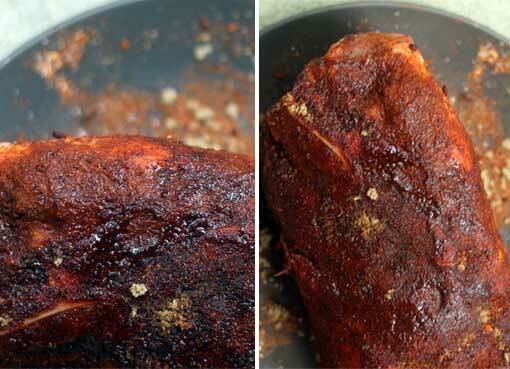 If the pork begins to brown too much, drape a piece of aluminum foil loosely over it or lower the heat. Transfer the pork roast to a cutting board, loosely tent it with aluminum foil, and let rest for 15 minutes. Pull off and discard any skin from the meat, then pull the pork into pieces, discarding any bones or fat. 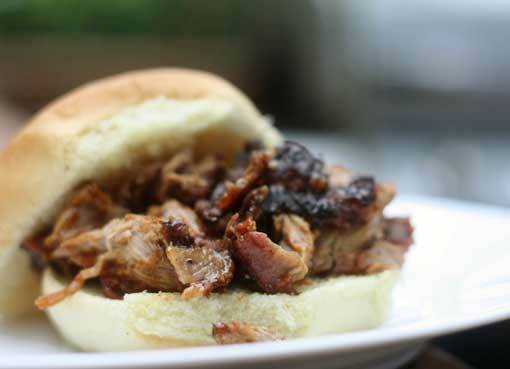 Using your fingertips or a fork, pull each piece of pork into shreds 1 to 2 inches long and 1/8 to 1/4 inch wide. This requires time and patience, but a human touch is needed to achieve the perfect texture. If patience isn’t one of your virtues, you can finely chop the pork with a cleaver (many respected North Carolina barbecue joints serve chopped ‘cue). 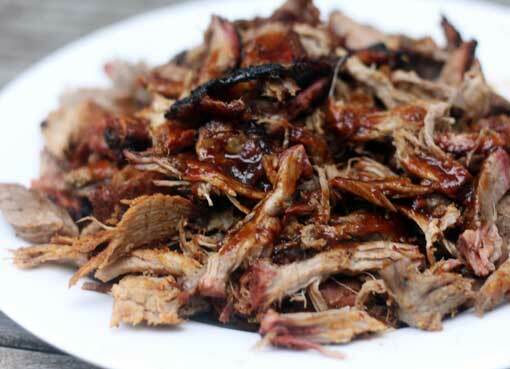 Transfer the shredded pork to a nonreactive roasting pan. Stir in 1 to 1 1/2 cups of the vinegar sauce, enough to keep the pork moist, then cover the pan with aluminum foil and place it on the grill for up to 30 minutes to keep warm. To serve, mound the pulled pork on the hamburger buns and top with coleslaw. Let each person add more vinegar sauce to taste. gotta love pulled pork. used to get this awesome pulled pork from a little dive in north carolina. reminds me of home.